We utilize cover crops seasonally to build, protect, and fertilize our soil, as well as provide habitat and food for insects, to foster a balanced farm ecosystem. The plants shown above are legumes, which allow us to add atmospheric nitrogen to the soil, in a 'plant-ready' form, via symbiotic populations of root-dwelling bacteria, as seen to the left. We plant insectary rows within our blocks to promote beneficial insects, such as predators and native pollinators, throughout the season. The calendula shown at right harbors a minute pirate bug (a tiny, yet formidable predator), and the borage is visited by a native bee (which is very valuable for tomato pollination). We employ very simple methods of planting our crops - many of which are directly sown by hand. 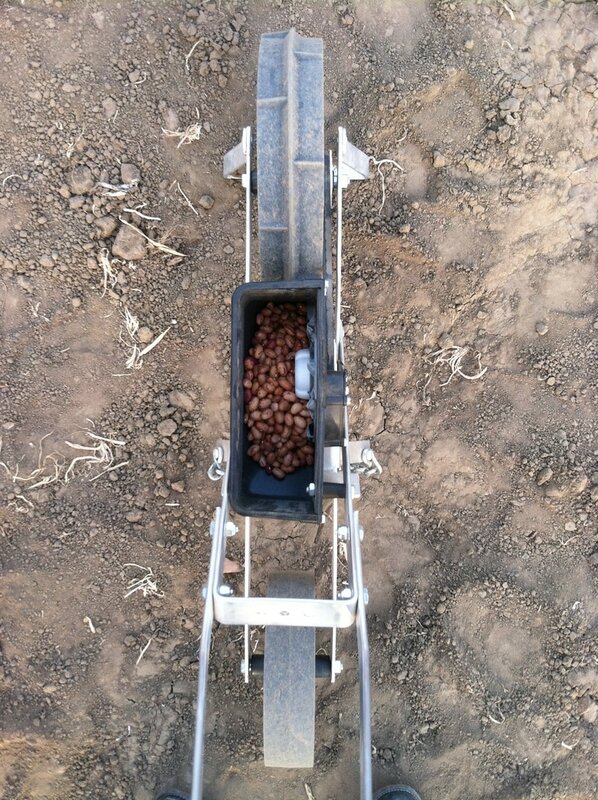 We use discs and chains on our toolbar to efficiently and evenly cover our seed potatoes. We use simple methods in the growing, harvesting, and processing of our produce. With a focus on small, lower energy, often 'human-powered' equipment, we balance efficiency and simplicity for a lower dependence on fossil fuels and lower negative impact on our soil structure. The sheller pictured is hand-driven to separate our dry corn from the cob, and we harvest, strip, and shuck our corn by hand, not by combine. 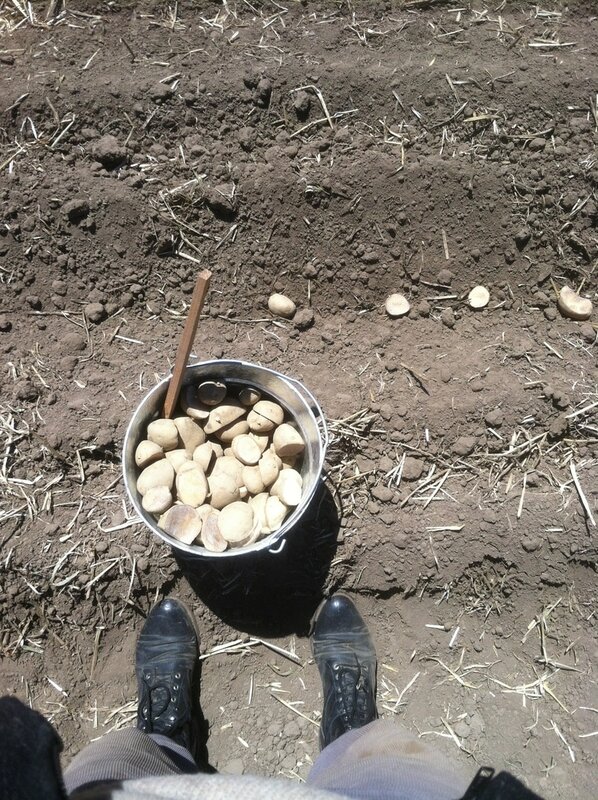 Our potatoes are dug using a very simple furrower shank, then gathered by hand. 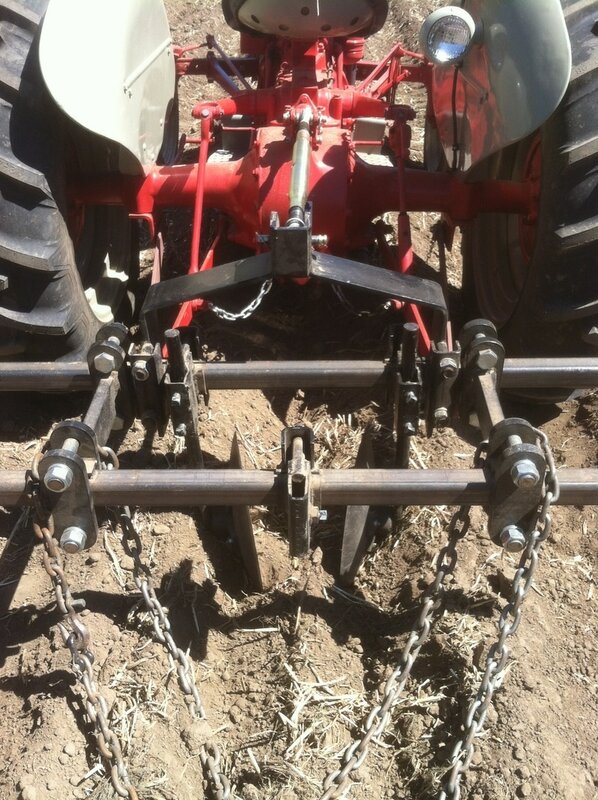 Our tractor's involvement in harvesting is very limited, decreasing the amount of deep compaction in the field. We try very hard to avoid all plastics on the farm, especially those which are disposable. 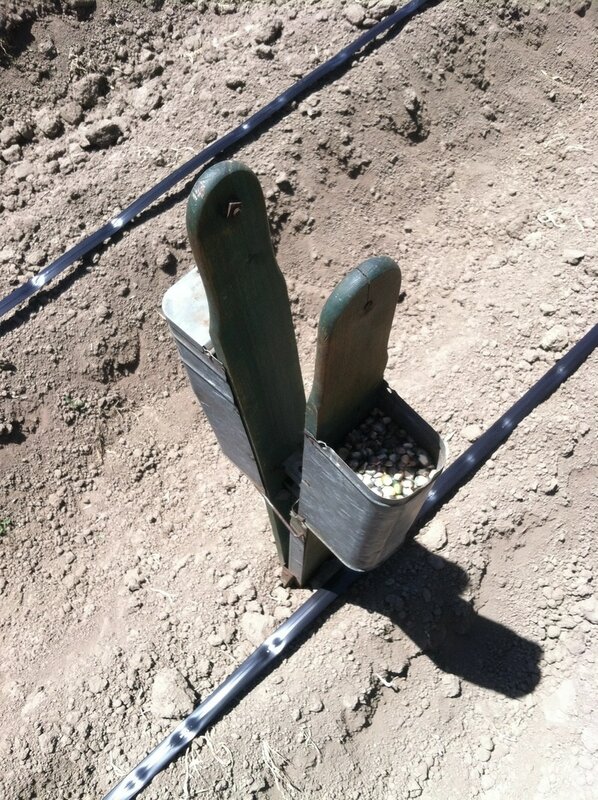 One exception is the use of drip irrigation. We have chosen this method over sprinkler irrigation because it is much more efficient, cutting the amount of water needed and minimizing evaporative loss. It also does not irrigate soil that is void of crops, such as furrows and alleys. We feel that we need to act wisely with this fragile resource. 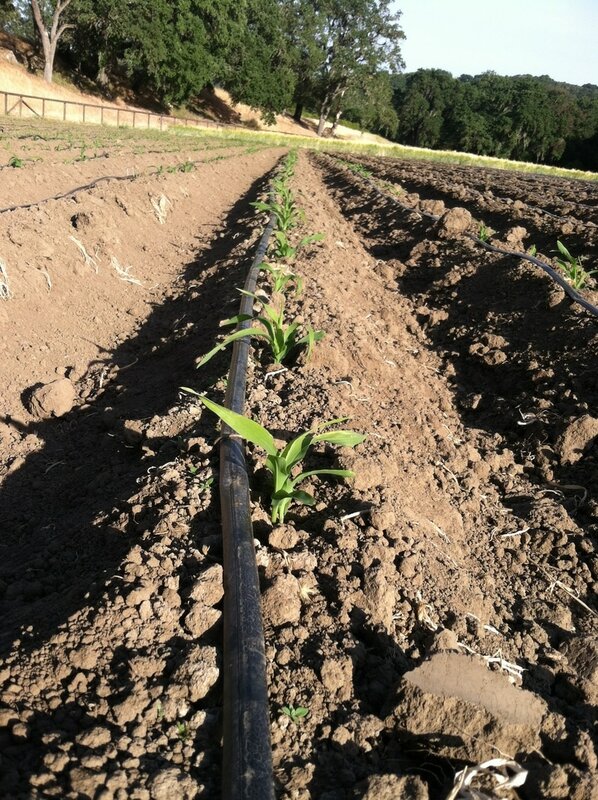 Aside from our irrigation system, you will find no plastic mulch, woven poly row covers, synthetic twine, plastic stakes, or any other material that would otherwise find its way into a landfill each year and resist decomposition. And in terms of our tools, equipment, and harvest supplies, we opt for the more durable and renewable materials wherever possible (i.e. : metals or plant-based products), in order to avoid the need for petroleum or GMO-based plastics.